EdApp’s new course collections feature allows you to group your courses into collections – making them easier to manage, and easier to access for your learners. If you’ve got a large volume of courseware that requires organisation under different ‘topics,’ the course collections feature allows you to quickly and simply manage them. For example, you can easily separate your product lessons out into segments, or keep your competency lessons all in one place. To use course collections, press the arrow next to where you would normally go to create a course. The “create collection” button will appear, allowing you to make a new collection. To insert courses into a collection, open the new collection and press the “utilities” menu. You’re also able to add a cover image, thumbnail, and configure other options for how the collection will appear to learners in the app. 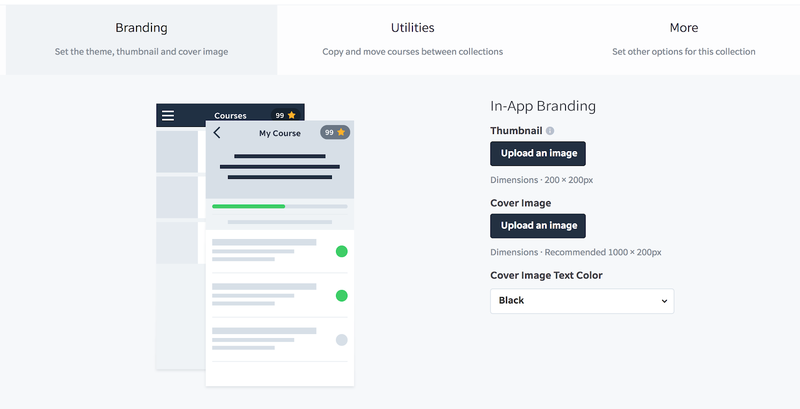 Course collections will then become the first thing that your learners see when they open the app, along with any courses that aren’t in a collection. Use course collections to separate product courses from competency courses and give your learners an easy way to see what is available to them – all with just a few taps. If you’d like to comment on this, get in touch at enquiries@edapp.com. You can also try EdApp’s Mobile LMS and authoring tool for free by signing up here or in the box below.